Hmmm…my curiosity was piqued. I (and my house) desperately needed to meet this woman with a passion for cleaning and organizing. So I Emailed Rochel Leah (Perl) Bulko, and she ended up coming over a bunch of times, and in her gentle, soft-spoken, lovely way she managed to make some order in this home where there had previously been precious little. My kitchen counter after the makeover. We Weisbergs are majorly into cornflakes: "Yellow" (that's Telma) and "Rooster" (Kelloggs). 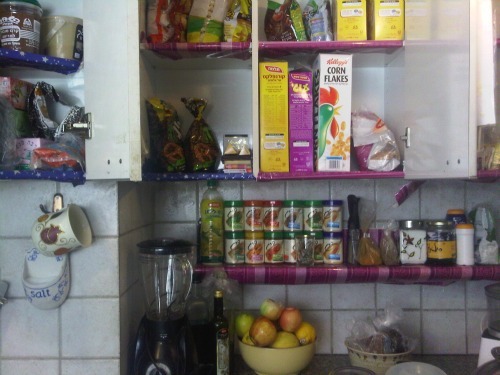 One of the main things Rochel Leah did to minimize clutter was rethink where we store things in the kitchen. 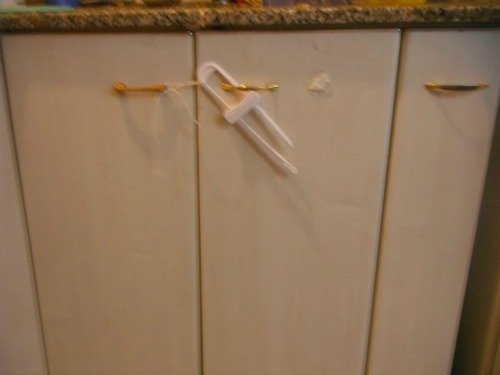 For example, we had our many cereal boxes squished into a narrow cabinet, so we would keep the overflow boxes on the counter or in other random cabinets. 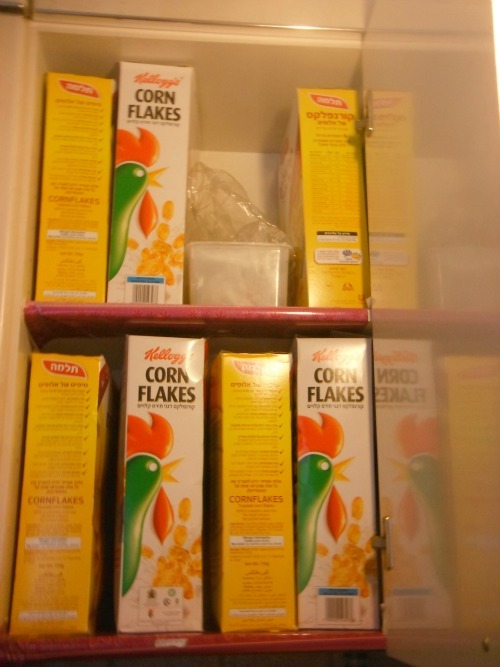 So Rochel Leah moved the cereal to a big cabinet that can accommodate all the cereal boxes. 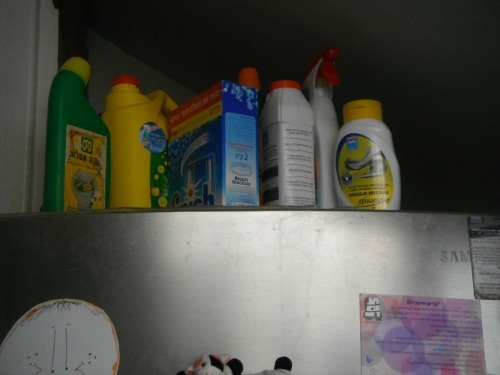 Here's the top of my fridge pre-makeover, covered from front to back with cleaning stuff. I liked to keep it up high so my little kids couldn't reach anything poisonous. ...locked away from little hands with a safety lock. 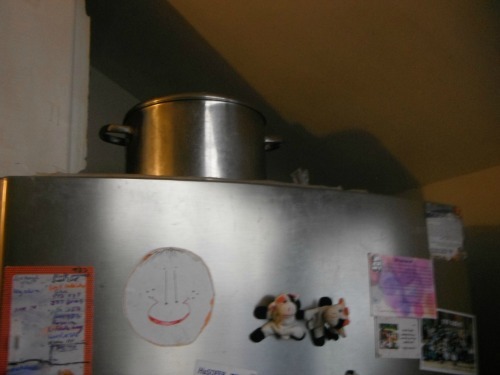 And now look how gorgeous and uncluttered my fridge top is...with just my big parve pot on it. 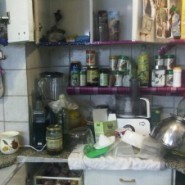 Here is the counter space next to my stove top, pre-makeover. 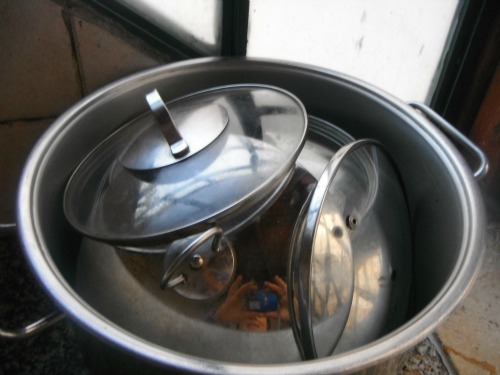 I kept all of my meat pots there all week round, since I couldn't fit them in my pot cabinet. And now, voila! 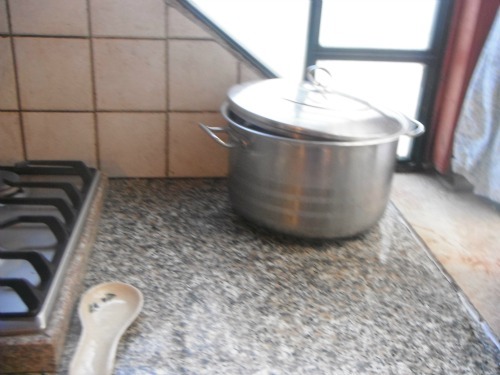 This is the counter space next to my stove top with a single huge soup pot on it (with a zillion pot covers hidden inside). Does your home also need to some organizational assistance? You can contact Rochel Leah at rleah64@gmail.com. 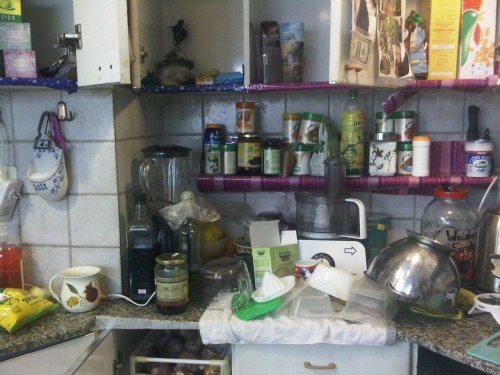 Another home organizing consultant in the Jerusalem area is Yael Wiesner, author of “How Does She Manage?” who can be contacted at yaelwiesner@gmail.com. If you know of a great organizing consultant in your community, feel free to mention in the comments below…. 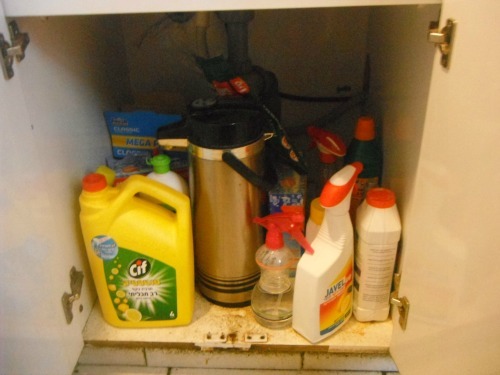 1) If you don’t use it often, shove it in the back of your cabinet or store it. Better yet, give it away. We need much less than we think we do, esp. 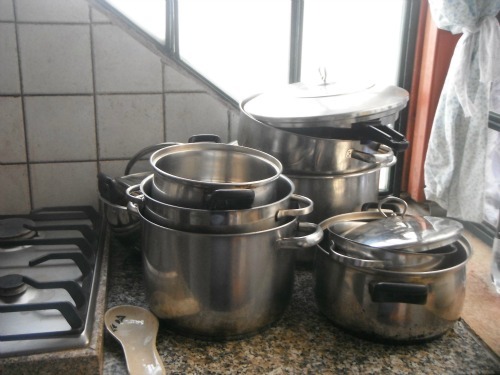 when it comes to pots and pans. 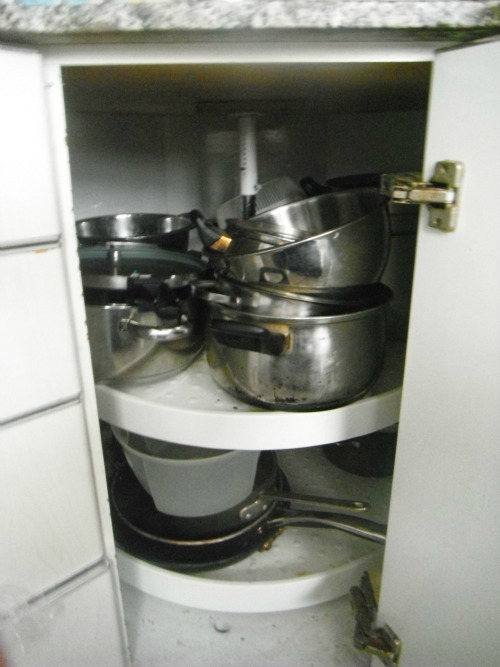 2) Use baskets to store items that you need to keep out because of lack of cupboard space. I put my KitchenAid mixing bowl and components in a covered basket on a cabinet. Same for clips and rubber bands. 3) A toy storage shelving unit was converted into a laundry station. It’s got 8 cubbies and each family member has his/her own plastic container with their name on it for folded laundry to be put into and then put away (teaches kids some responsibility too!). BTW, you’re quite the spice girl! could you explain more about this laundry system? My messy kitchen was nothing compared to my current mess of a laundry situation. I love big re-organizing projects, especially in the kitchen, where we spend most of our time. Makes me feel like I have a brand new kitchen each time! I am a great believer and practitioner in the “basket for everything” tip mentioned above. I like to call myself “the basket case”…. seriously though, you “clutterbugs” out there looking for organisers should know that someone impossibly neat like me truly yearns to be able to just “let it go” sometimes. It seems that it’s simply not possible, but I’m open to tips!!!! And I am s mother of messy kids who hates cleaning. I could use you in my home any day! I do recognize the advantage that I’m more easy going about it all, but once “the mess grows bigger” I kind of get super fed up and cranky. My favorite laundry tip is to have about three dirty laundry hampers kept in a bathroom or near the washer if possible (rather than individual ones in the bedrooms) One is a white hamper, for whites/undershirts or other white items that can be bleached. 2nd is for lights/permanent press items – for light colored and 3rd is dark hamper for dark items. It helps the kids learn to sort laundry and even an occasional mistake is easily picked out as you dump the contents of the hamper into the washer. This avoids having dirty clothes that then have to be sorted etc. or accumulate before washing. I enjoy folding clothes while listening to shiurim but kids over the age of 7 or 8 can help with this chore and deliver clean clothes to the beds or dressers where they are stored. It is a great feeling to have things orderly and it takes less time to keep it that way once you have a system in place. A parent of one of my students just wrote a book called, “From Frazzled to Focused” the subtitle is The ultimate guide for moms who want to reclaim their time, their sanity and their lives. The author is Rivka Caroline. This will help those of you who really want some good ideas to keep things sane. I think it is available on Amazon. Now the trick is to find time to read it! One of the best purchases I ever made was five secondhand modular baskets from a closing business – the type they have at every shekel store and baazar strauss here in E”Y… you know the white metal baskets to hold anything from socks to small plastic toys. I labeled them Darks, Coloured, Whites, Delicates, and Sheets and Towels (becasuse that one takes up its own basket with a husband who mikvahs daily and kids in various stages of potty training). The baskets are open enough that you can just toss anything right in, the lip at the bottom keeps things from falling out, and they are the perfect size for single load, so you (okay, I) don’t have any excuse to procrastinate. Now I need to figure out a system for the pretreating. Anyone have any ideas? I’ve got cheap plastic hooks that have stickers at the back. Hung them in a pattern behind the door in my bedroom and I hang up the tichels there. The system works well for necklaces, too. As long as it’s not my mess (and even if it is, if I’m feeling inspired) I’m great at this stuff. Cleaning I hate. Organizing? Sounds good to me. But I have to have energy for it. Life changing tips, book, homemakers calendar, etc, tailored to the busy Jewish home. It’s made a huge difference in my life.